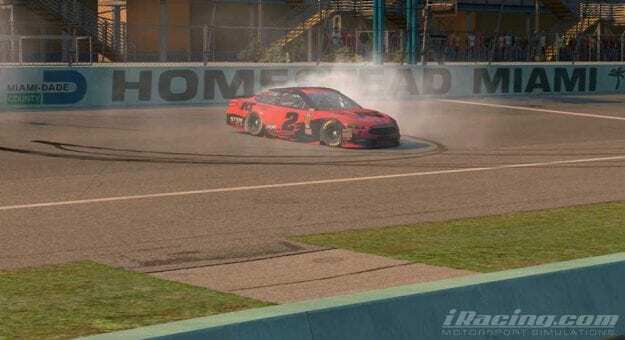 Ray Alfalla won an unprecedented fourth NASCAR PEAK Antifreeze iRacing Series championship, playing a perfect pit strategy to beat last year’s champion Ryan Luza. Alfalla wins the top prize of $10,000, a NASCAR Championship ring and trophy, plus a trip to the Monster Energy NASCAR Cup Series finale to be presented his prizes on stage before the driver introductions. Alfalla started ninth but only took 16 laps to crack the top five. It was Luza, however, who looked to have the car to beat early on, and while Alfalla could keep pace, it looked as if he was designed to finish runner-up. With laps winding down, Alfalla made his move, pitting two laps earlier than Luza and taking advantage of his fresh tires to overtake Luza when he returned to the track. Luza emerged nearly half a straightaway behind but started to close the gap with his fresh tires and long-run speed. By the time there were 10 laps to go, Luza had closed within a second of Alfalla and began to set him up. Alfalla committed to the lower groove and looked unwilling to move around, but Luza kept searching different lines for grip. Luza found speed in the high groove, but with laps winding down, he was not gaining enough on Alfalla. On the final lap Luza gave it one last go, taking the high groove through Turns 1 and 2 as Alfalla stuck to the middle. Alfalla rolled the middle of the corner much better and maintained the gap, leaving Luza with one more opportunity in Turns 3 and 4. Luza chose the bottom this time, driving hard into Turn 3 and nearly reaching Alfalla’s rear bumper. His attempt fell short, and to make matters worse, Luza’s car appeared to run out of gas exiting Turn 4, leaving him one place short of two championships in a row. Nick Ottinger started on the pole and looked to play spoiler but only led eight laps before Luza sailed past. Ottinger wound up 24th after being caught up in a crash involving Taylor Hurst and Michael Guest. The two other Championship 4 contenders, Michael Conti and Matt Bussa, never showed the speed to compete for the title. Conti started near the back after making a mistake in qualifying but gained track position on pit road by taking two tires during the early yellow. Unfortunately, a long run immediately followed and Conti slipped through the field. Once he was on equal tires his car simply could not keep up on a short run. Conti finished third, 4.6 seconds adrift. Bussa started eighth and, like Conti, lacked short-run speed. Bussa tried a different strategy on the last run, pitting several laps before the rest of the leaders. While Bussa did emerge in front of Alfalla and Luza, his tires were too worn and both easily moved by. Bussa continued to slide and wound up eighth at the checkers. Alfalla’s fourth championship may be his most improbable. While he won two races he only led 52 laps all season and usually was not the car to beat. His consistency was vintage Alfalla and once the playoffs came around he found just enough speed to take home the top prize. Luza, on the other hand, was the class of the field for the first half of the year but slid a bit late as Conti came on strong. Late in the season he appeared to find some of the speed he lost and probably had the best car at Homestead, but a small slip on strategy was all that separated him from a second title. With the NASCAR PEAK Antifreeze iRacing Series on break until February 2019, focus shifts to the NASCAR iRacing Pro Series. The bottom 20 drivers from the 2018 NASCAR PEAK Antifreeze iRacing series will take part along with transfers from iRacing’s Road to Pro Series. The top 20 will transfer to the 2019 NASCAR PEAK Antifreeze iRacing Series to challenge Alfalla, Luza, and the rest for the title. After one of the most competitive NASCAR PEAK Antifreeze iRacing Series seasons ever, the bar is set high for 2019. Can Luza rebound after coming up just short? Will Alfalla make it five titles in nine years? Or can a newcomer burst onto the scene much like Luza did in 2017? The iRacing eSports Network will cover all the action starting in Daytona next February.